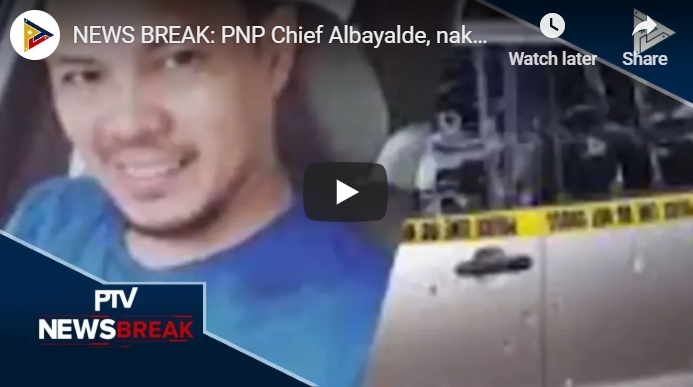 [VIDEO]:NEWS BREAK: PNP Chief Albayalde, nakatutok sa imbestigasyon sa pagkamatay ni Richard Santillan. Public Attorney’s Office chief Persida Acosta said that an autopsy by the agency finds that Richard Santillan III, the aide of Atty. Chong was tortured before he was killed. According to police, Santillan and his female companion were killed in an operation in Barangay San Andres, Cainta, Rizal on December 11. Therefore, it suggests that the dead body of Santillan was dragged into the road to make it look like a shootout. The police reportedly intercept Chong’s vehicle driven by Santillan. But the aide allegedly steps on the gas instead of pulling over. This they said is the reason for the brief exchange of gunfire. However, there is ample physical evidence that the incident was definitely not what the men in uniform said it was. Acosta describes the scenario as the dead speaking from the grave. Santillan was Chong’s driver and bodyguard that he treats like a brother for the last eleven years. The lawyer is a former Biliran representative who is now running for Senator. The aide stays at the election fraud whistleblower as he exposes the Comelec and Smartmatic’s fraudulent acts. He was also active in endorsing Chong for the national position in his own capacity. The widow of Santillan attests that her husband can’t possibly do any crime that the police insinuates because he was always with Chong. Dr. Erwin Erfe, PAO’s forensic laboratory director said that their examination shows that Santillan was shot even though he was already dead. PAO Chief Acosta added that Santillan’s family is seeking justice because of the alleged torture. The Public Attorney’s Office is mandated to render free legal representation, representation, assistance, and counseling to indigent persons in criminal, civil, labor, administrative and other quasi-judicial cases. Acosta clarifies that since Santillan’s surviving wife is earning only a minimum wage, the family is considered an indigent. “I have no enemies except for Comelec and Smartmatic, Chong said. This is the only angle I can see for this incident. They want to scare me by hurting the people close to me,” he added. The lawyer’s testimonies in congressional inquiries on alleged poll fraud in the 2016 elections are really vital in Marcos’ election protest against the presumptive VP, Leni Robredo. Meanwhile, the PAO chief asks for records of the police operation that resulted in the death of Santillan directly from Director General Oscar Albayalde. He responds with a promise of justice should his men be found guilty of Chong’s accusations. Former Bayan Muna Rep. Satur Ocampo denies recruiting minors to join communist rebels as his group was intercepted in Davao. He, however, admits the presence of the NPA in the area. He also agrees that there are Lumads who joined the New People’s Army. The mainstream media seem to highlight the incident. It could just be a basic security protocol. Impartial reactions can definitely lead to the wrong conclusion. 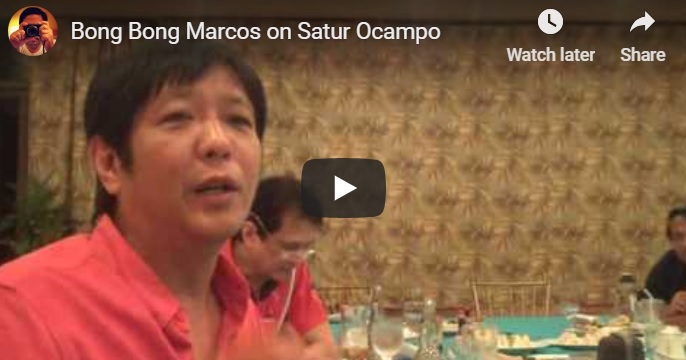 Looking back to Bongbong Marcos’ interview on Ocampo, he is not vindictive knowing that the latter’s advocacy is to try to help ease poverty in the country. Marcos said that despite their difference in ideology, he is for working together for the good of the country. Ocampo also said he is no longer part of the CPP-NPA. He maintains that his actions are independent. Ocampo and 17 other leaders of militant groups and volunteer “Lumad” or indigenous teachers were put in a temporary prison cell. Human trafficking of students, kidnapping and child abuse are their alleged offenses. It was in a village of Talaingod town in Davao Del Norte. Ocampo’s group insists that they were on an emergency rescue with consent from the parents. Philippine National Police chief Director General Oscar Albayalde, meanwhile, welcomes the group’s threat to sue the authorities if there are mishandlings over the case. Ocampo has no knowledge of Albayalde’s claim that the Lumad students in Davao Del Norte practice a different national anthem taught by the rebels. Tagum City Executive Judge Arlene Palabrica ordered the release after their lawyers posted a total bail of P1,452,600. Davao del Norte police “initially wanted to defy the order.” The police argued that the P80,000 bail was for the child abuse charges only. It does not include the kidnapping and human trafficking charges. They are still under investigation. Politicizing issues with the help of the mainstream media might come very handy for politicians seeking positions for the election 2019. Bongbong Marcos’ ideals linger as he speaks fairly about Filipino politicians with an ideology opposite his. He sees no reason why he must contain his anti-poverty measures among his supporters only. Leaders from all factions must work together to alleviate poverty nationwide.